Part of the Junior’s Solution. 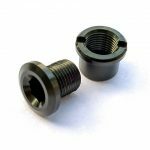 The Fit Link is an adapter for mounting a braze-on style front derailleur to and below a bicycle frame braze-on tab to accommodate smaller front chainrings. 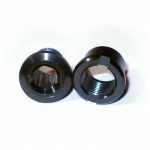 A great solution for those that want to run smaller front chainrings on their road, CX and gravel bikes. It’s also a new and better approach to meeting governing body gearing requirements for Junior road races. 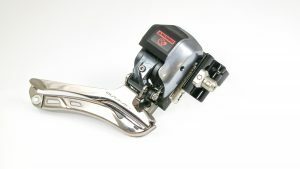 The Fit Link provides a way for mounting a braze-on style Front Derailleur to accommodate smaller front chainrings such as 41/33, 42/34, 44/34, 46/36 sets– it’s an adapter that allows a sure footed mounting to and below a bicycle frame braze-on tab. The Fit Link simply mounts to the existing braze-on tab, then the front derailleur mounts to the Fit Link. Our new model also works with a Di2 FD, no adaptor needed for the Di2, it’ll mount right up with this adapter. This product is also a part of the WickWerks Junior’s Solution. 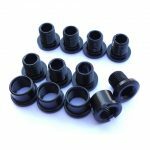 You can read all about the advantages for this system in this article. – Works with most road bike models from most manufacturers having a braze-on front derailleur tab or clamp on braze-on mount. 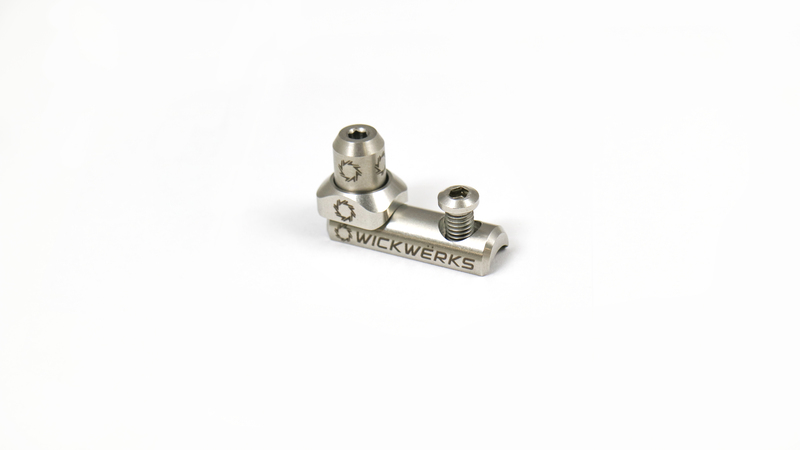 – WickWerks does not guarantee fit on all bikes. 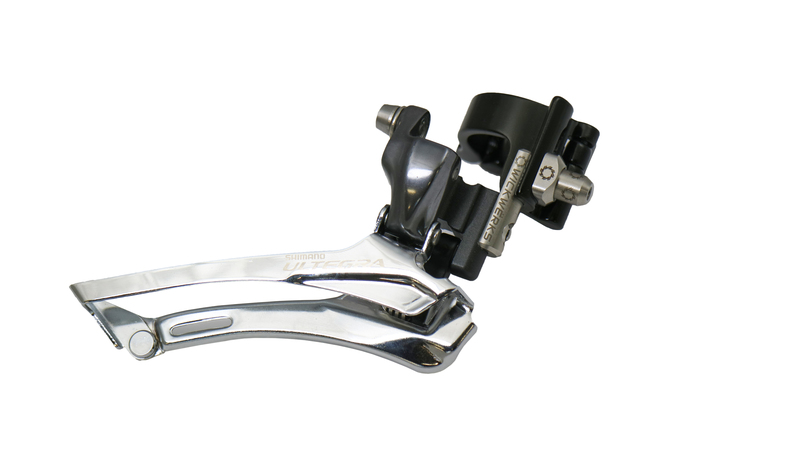 The frame braze-on tab can be different, and mounted different on various bikes. 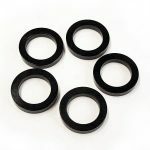 If your bike was made for 50t – 54t rings, then the adapter will usually work for the 41/33, 42/34, 44/34, 46/36 rings. 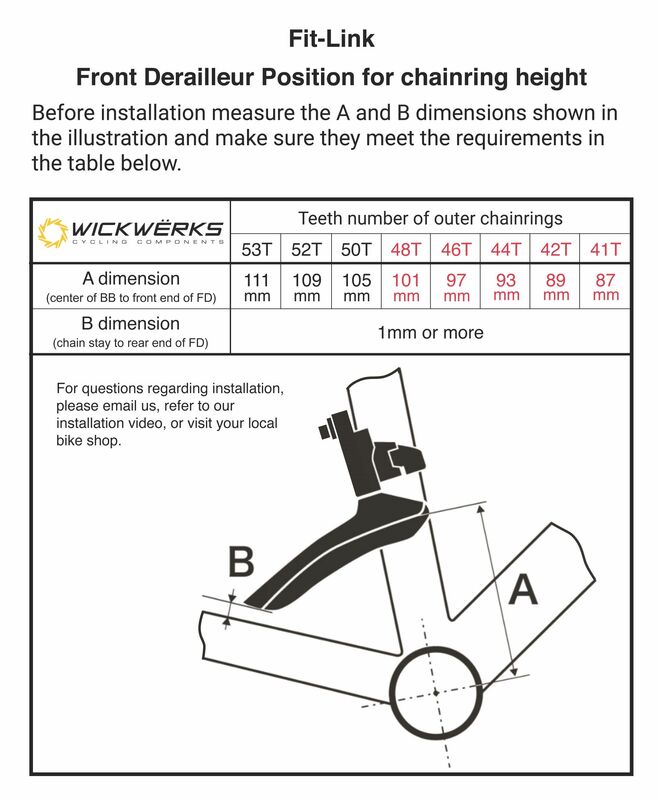 – Some bike frames flair out very wide just below the braze-on tab. 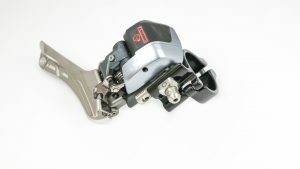 Some of these bikes have proven more difficult to mount the lowered derailleur on. 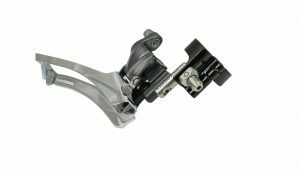 – Di2 front derailleurs are compatible with the Fit Link! Unfortunately the eTap body is too wide and won’t lower past the top of a braze-on. – For some frame and front derailleur combinations, long cages may interfere with frame chain stays when the front derailleur is lowered to work with the 41T chainring. If this happens, use a shorter cage front derailleur. A good one (made by Microshift) is available from Gevenalle. 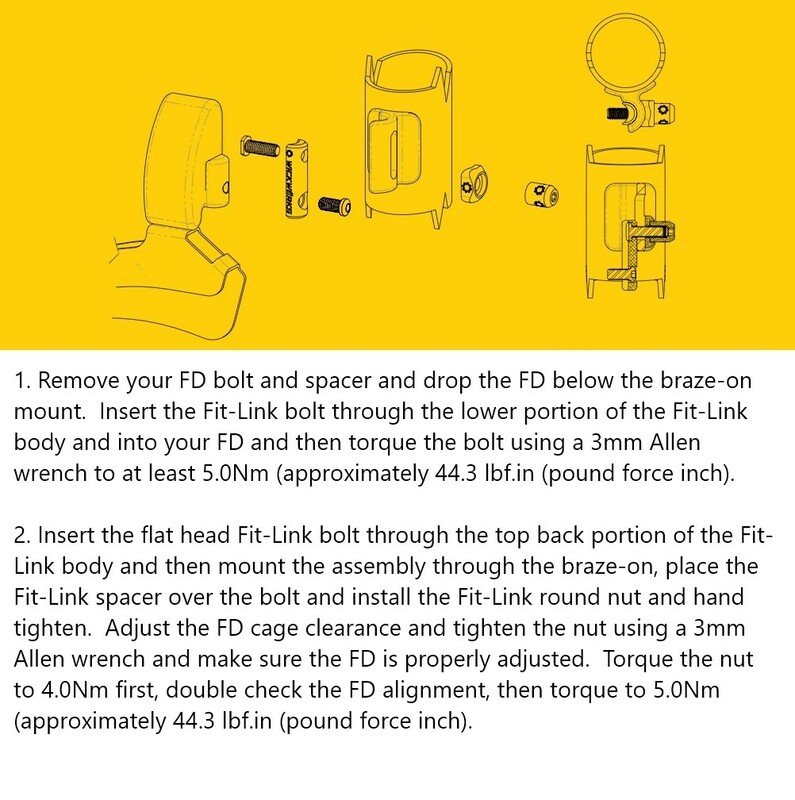 Some people want smaller front chainrings on their road, CX and gravel bikes, so the Fit-Link is a perfect solution to get the optimum FD cage height for better shifting. 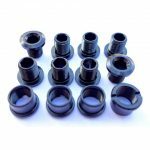 Bikes are typically made for standard size road rings and the braze-on tab is made to adjust for typical sizes, 53/39, 52/36, 50/34 chainrings. That works great for most, but the special case of Juniors in sanctioned road racing, it can be difficult. 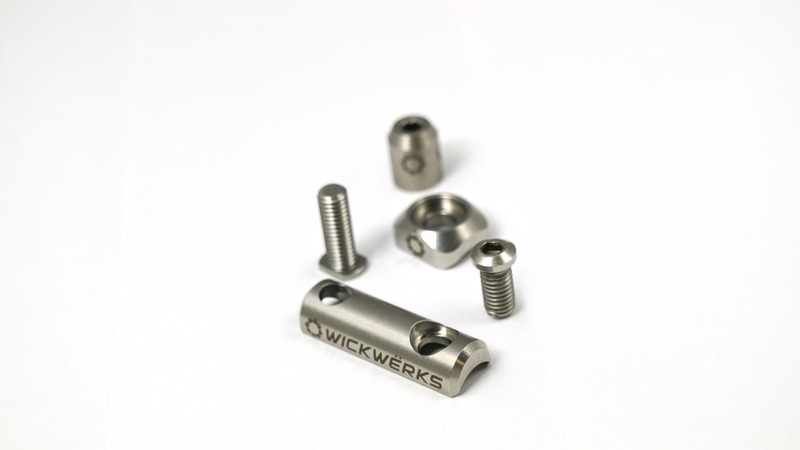 That is why WickWerks created “The Junior’s Solution”. Of course, the typical approach for juniors is a 52 up front and a special “Junior Cassette” in the back to meet the rules. This approach works for the rules, but leaves some difficulties in other areas. WickWerks now presents a different, arguably better solution for many juniors and many situations. 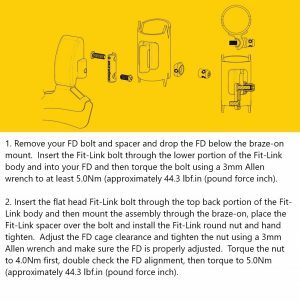 Read the full details in this article, and get your complete setup, 41/33 chainrings and the Fit-Link here.